Photo 006. Bismarck anchored Grimstadfjord. Bismarck anchored in the Grimstadfjord. This is the famous photograph taken by the British Spitfire (Suckling) at 1315 hours on 21 May 1941. 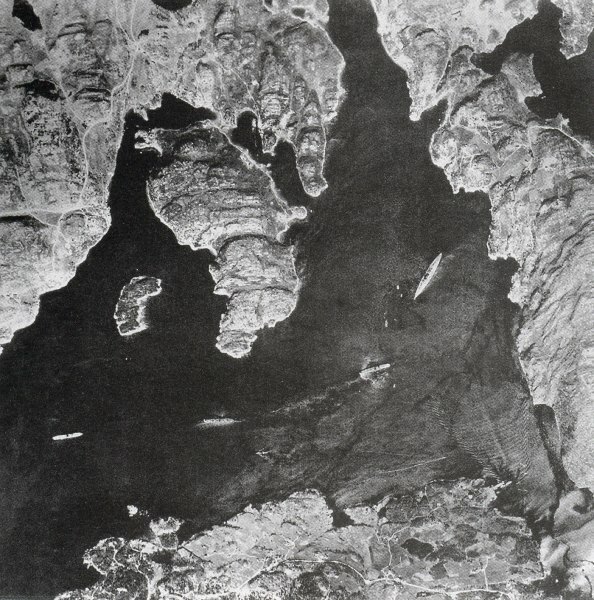 The Bismarck can be seen to the right anchored in the Grimstadfjord near Bergen, Norway, with three merchant ships. Position 60º 19' 49" North, 05º 14' 48" East. The steamers would serve as torpedo shields in case of enemy attack. Unlike many other publications, this photo is shown here in its correct orientation, North up.